I saw this show at De Santos. It opened November 7, so it may not still be up--but no other show is listed on their web site, so interested viewers may still have a chance to see them. 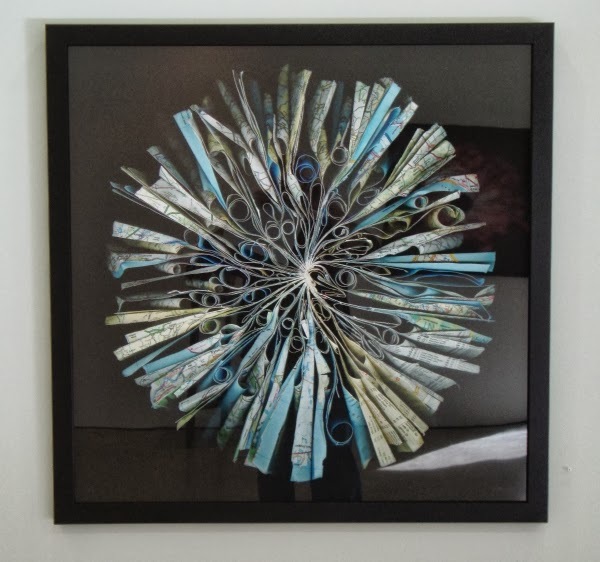 Cara Barer works with books. 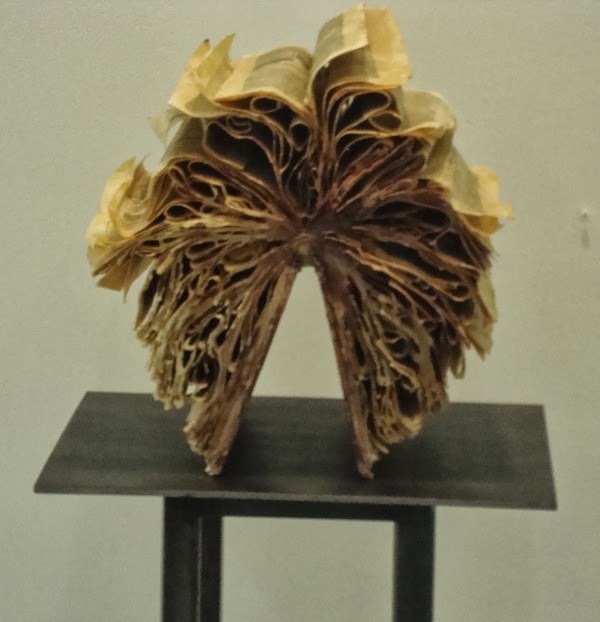 About half of her work takes big paperpack books with very flexible spines (or saddlestitching) photographed from the bottom, opened up to resemble flowers. 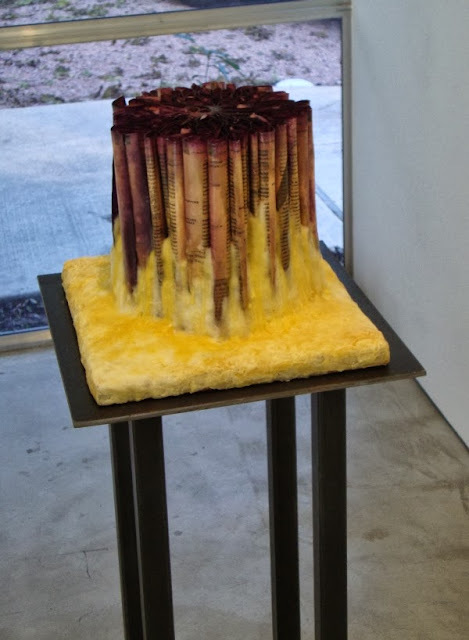 Most of the rest are sculptural works where the book is part of the sculpture. She encases these poor books in wax. 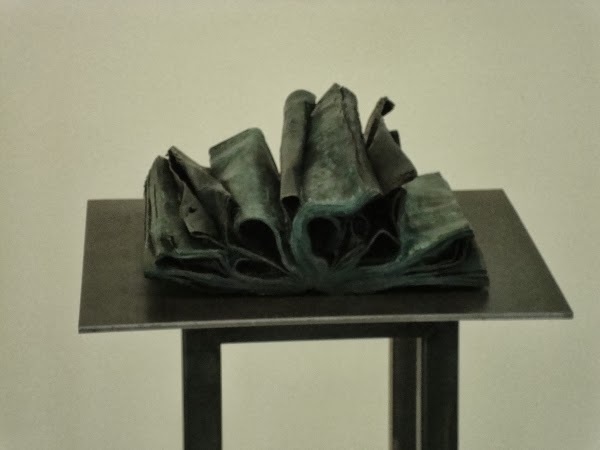 And in one case, the book has been cast in bronze. Electronic storage and retrieval of knowledge implies a certain high level of civilization and a complex economy made up of millions of individuals. So far it's been petty robust, but we're just at the beginning of it. There are definitely events that could end electronic storage and retieval--any horrible extinction level event that greatly reduces the population of Earth, or some huge electromagnetic disturbance (like a magnetar explosion in the cosmic neighborhood of Earth) could do it. Books, on the other hand, require simpler technology and smaller economies (fewer individuals with fewer hyper-specific skill-sets). I therefore agree--repositories of physical books should be made, no matter how advanced we get with electronic data storage and distribution. 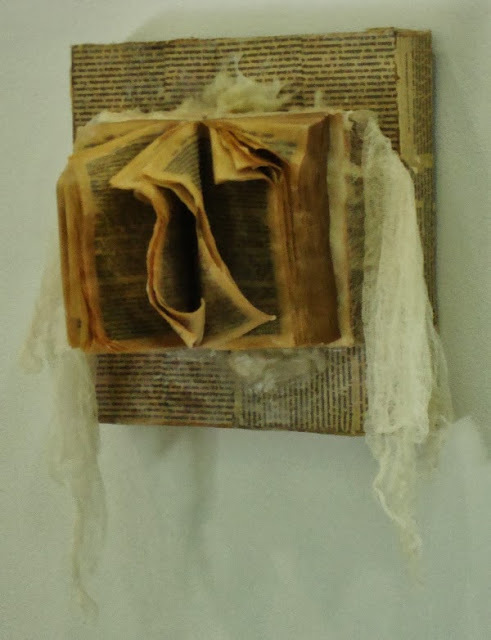 And I find these wax encrusted books beautiful. They shouldn't be in a white-wall gallery though--they feel ancient and deserve dark, smoke-stained wooden walls.